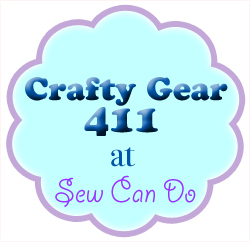 Sew Can Do: Crafty Gear 411: Let's Get Snappy Giveaway! Crafty Gear 411: Let's Get Snappy Giveaway! 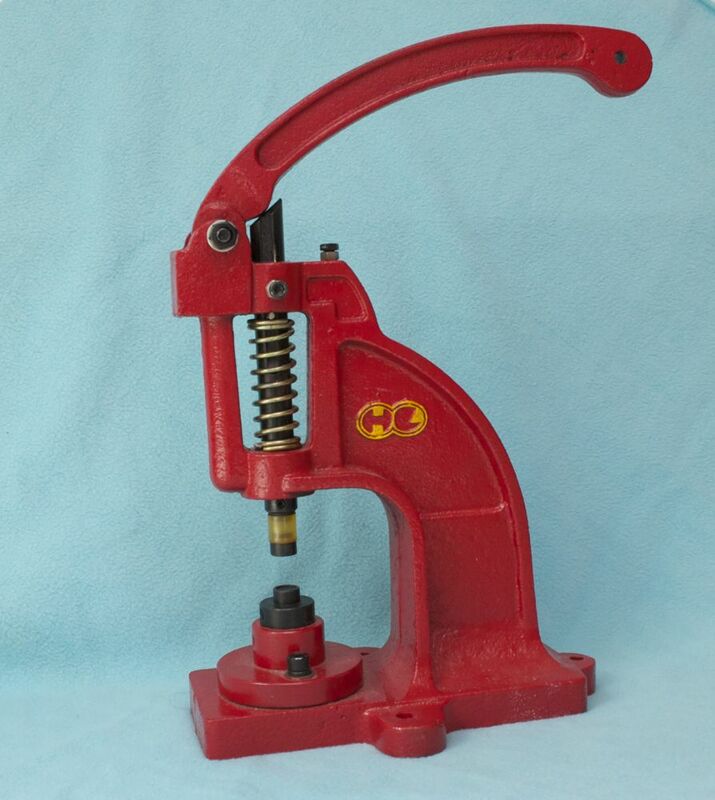 I thought I'd kick off my new Crafty Gear 411 series with one of my favorite sewing related tools, my Snap Press. I took the plunge and bought this almost two years ago and it has been one of the handiest items in my sewing tool kit. A snap press is for setting snaps into just about anything - clothing, cloth diapers, bags, home decor, etc. Basically anywhere you would want to add a snap. It uses dies for both sides of the snap. You just click one side into a die in the press, put the cap part (that looks like a tack) underneath, stick your fabric in between and press down on the handle. 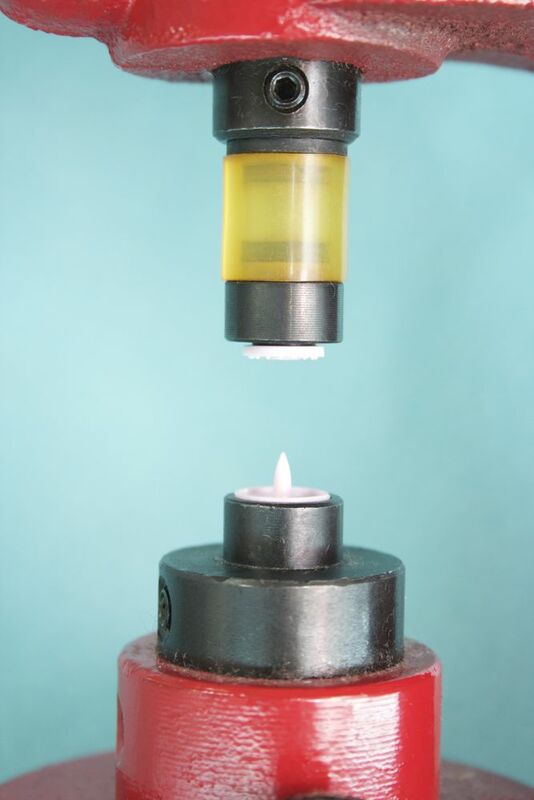 The press pushes the cap into the socket or stud and presses the pointed end back downward so they lock together. To reinforce the snap area if the fabric is lightweight or stretchy, just add a layer of stabilizer in between the fabrics or an scrap of fabric for an extra layer before setting the snaps. I've got the dies for plastic snaps, but you can also get extras to do traditional metal snaps too. Why do I love this tool? - Snaps are such a handy closure, but the sew on kind tend to fall off with wear and the kits you get at the fabric store for hammering pronged snaps rarely go in smoothly. And if they come out or you try to reset them, the prong parts rip up the fabric so it becomes a mangled mess. No thanks! In the rare times I've had to reset a plastic snap, it took mere seconds and didn't ruin the fabric because they only make a small single hole in the fabric. 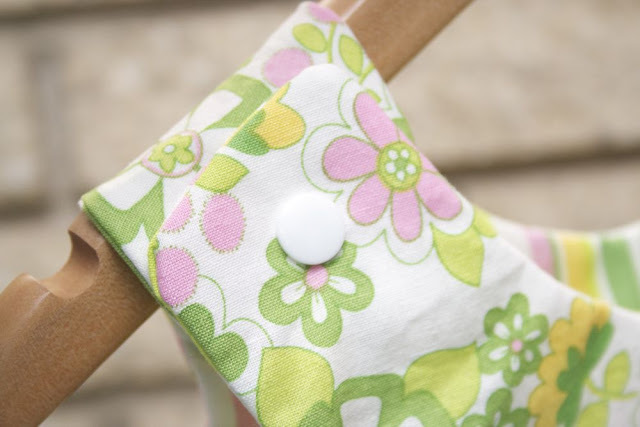 - Taking 30 seconds to set a snap with the press is A LOT faster than putting in a zipper, buttonholes or velcro, which leaves more time for sewing the fun parts of projects. - They give a professional look. 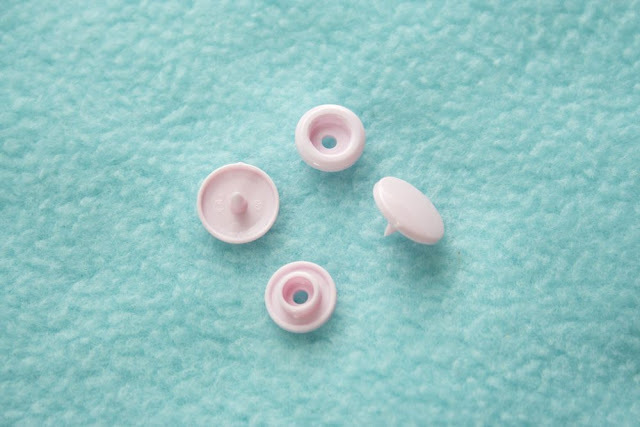 They look sleek and uniform and because they go in so smoothly, there's no chance of wrecking a nice sewing project at the end by goofing up on the closure. You can also match them to the item so your handmade project can have all the coordinating details that the store bought stuff has. 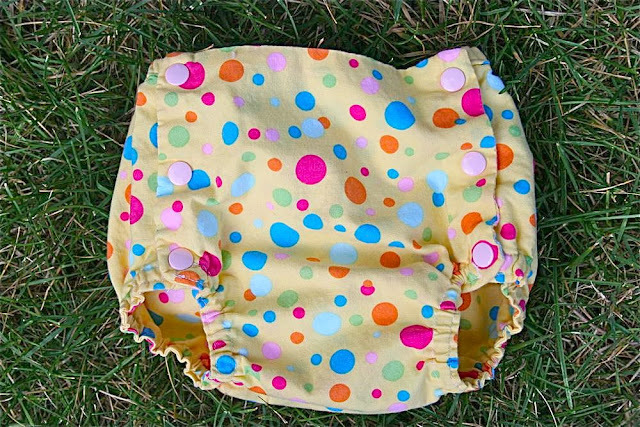 - The snaps can take the constant pulling and wear from cloth diapers, snap-up legs on baby pants, overall straps and the backs of shirts and still look like new. They're also great for repairs on things that have worn out. - Plastic snaps are durable, but inexpensive. You can get a couple hundred of them for the same price of a single package of 6 basic snaps at the chain fabric stores. The actual press is a little investment, but if you sew a lot like me you'll find you use it over and over again so it is well worth the up front cost. I got my snap press & snaps from KAMsnaps. The model I have is the DK98. I spent a lot of time researching online and this was the place that had the best selection of snap stuff and got rave reviews. They also have helpful Getting Started and Tutorial sections to help decide what you need and how to get the most out of it. That they offer free priority shipping on US orders over $28 (and free first class shipping on most Canada orders over $35) was a big deal to me too. A snap press weighs 10-20lbs so this helps save some $$! It also doesn't hurt that they have an awesome selection of snaps - all kinds of colors, shapes, even engraved designs. When I told Judy at KAMsnaps I was planning on doing a post about my love of my snap press, she graciously offered to do giveaway to go with it so a Sew Can Do reader could get snapping too! KAMsnaps is giving away a $27 coupon code good towards a pair of their Snap Pliers! Head over to KAMsnaps & check out their fabulous snapping gear. Then come back and leave a comment saying what your favorite item is. Be sure to include an email address if it's not on your profile. The giveaway will be open until 11:59pm EST on September 14th, 2011is closed. A winner will be chosen at random and announced the following weekend. Good luck everyone! I love the purple & lime ooga booga fabric! I follow Kam Snaps on Twitter. I follow the Kam Snaps blog. I follow Sew Can Do. I like Sew Can Do on FB. Following sew can do!! Thanks!! I like sew can do on fb!! Following kam snaps on twitter! Love the colorful engraved animal snaps! Great giveaway, thanks much for the chance! I really love all the engraved plastic snaps, esp. the VW bug! I did not know that there are colour or decorated snaps! Great giveaway! I like the chocolate snaps and of course their Snap Press and pliers! I just love the Chocolate Monkey Engraved & Painted snaps! SO ADORABLE!!! I'd love a pair of the KAM snap pliers. I have one of the junky things from the craft store that you use a hammer with, but it's worthless! oh, i NEED a good snap press or pliers!!! No way! Great giveaway! I've always wanted one for diapers. I love the variety of snaps. So many colors! Sadly, I have no other social media outlet, so this is my one shot! Love the heart and star snaps. They are super cute! I love the ooga booga engraved snaps. I follow Kam Snaps on Facebook. 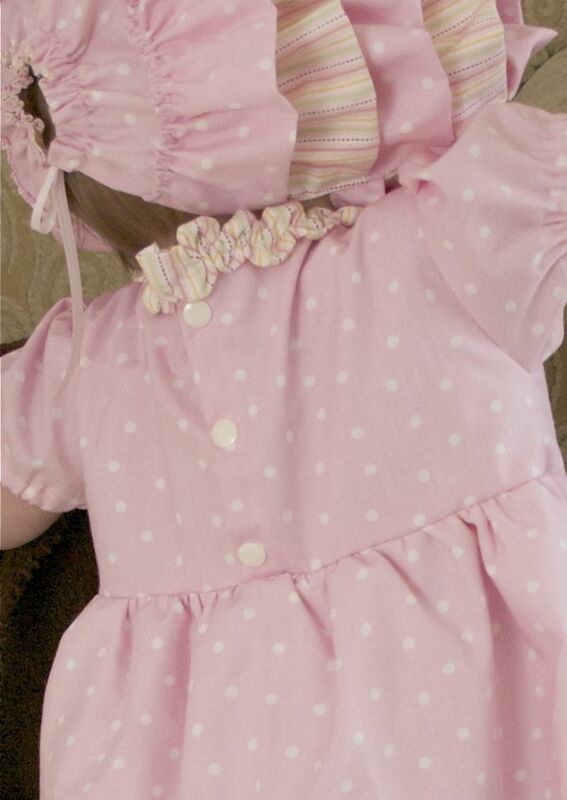 The plastic daisy snaps are super cute! I'm already a Follower of Sew Can Do. I'm now a Follower of KamSnaps! Thanks for the awesome give-away!!! Just liked Sew Can Do on FB! Like I said, awesome give-away!!! Thank you. I follow Sew Can Do! This tool is amazing! I had no idea they existed! Liked Sew Can Do on FB, too! I love love love the Cupcake engraved snaps! I follow the Kam Snaps blog as Mechele Johnson. I subscribe to KamSnaps mailing list. I like the engraved ooga booga snaps. Follow KamSnaps on Facebook (Sarah Jane). Follow Kam Snaps on Twitter (@mummytocharis). Follow KAMSnaps blog as mummytocharis. Like Sew Can Do on Facebook (Sarah Jane). Joined KAM Snaps' mailing list. I liked KamSnaps on facebook! I now follow KamSnaps via GFC! I'm a follower of SEW Can Do via GFC! I like Sew Can Do on facebook! I love the mixed colors sets...it's a cool way to get a lot of colors if you're willing to mix & match! I would LOVE a pair of KAM snap pliers! Besides the wonderful snap press I absolutely love the engraved dragonfly snaps! I like the 500 pc random color snaps. It would be a fun surprise! I love the ooga booga fabric. i love the monkey snaps! My favorite are the ooga booga snaps. I like the engraved car snap- my son would love it. I love the Skull engraved snaps! Too Cute!! I love the snap press! It rocks!!! I follow KAMsnaps on twitter! I like KAM snaps on fb! I follow Sew Can Do!! I'm on KAM snaps' mailing list!! I love the new heart shaped snaps! I now follow the Kam Snaps blog. I like Kam Snaps on Facebook. I get Kam Snaps newsletter. I like all the fun colors of snaps available! I like Sew Can Do on Facebook. I subscribed to Kam Snaps blog. I love the pliers and the colorful snaps. I love the ooga snaps!!! I love all their cute snaps and of course the snap pliers (and press!). I love the color selection and of course the snap pliers (and press!). I'd love a snap press from KAM. I like KAMsnaps on Facebook. I like the KAM blog on Facebook. I follow the KAM blog. I follow Sew Can Do and KAM Snaps blogs. I like Sew Can Do and KAM Snaps on Facebook. Love your red snapper best. Wish I had this when I was just working on that cute little dress with six buttons. I'll have to get the pliers for the next time I use that pattern.